When it comes to going out, Coop’s Smokin’ Wing House is a place where you can feel like an adult and still bring your kids. So pull up a seat, watch the game, and relax with great friends, family, and of course – food! We have a great sports bar for the whole family to enjoy! 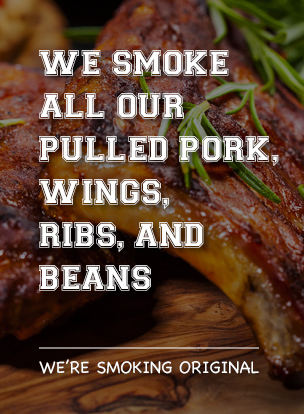 Coop’s specializes in wings and ribs while offering a selection of burgers, sandwiches and more! Our Heat Meter prepares you for the whammy of a hit you’re gonna get – packed with mouth-watering flavour! So if you want to be “safe” at a plate, the best choice you could make is coming to Coop’s Smokin’ Wing House! Did we mention that we have the best Daily Specials in town? We do – so be sure to check them out. For large groups, please call for reservations. We’ll have your table ready!